Best Buy is celebrating Cyber Monday in the best way possible! 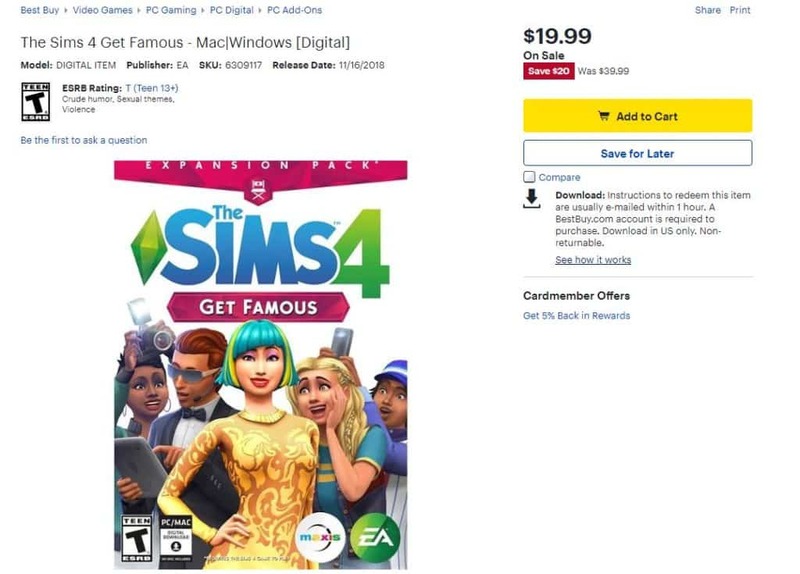 They have just published a new sale including The Sims 4 Get Famous Expansion Pack which is now 50% off! Yup, you can get the pack for only 20USD which is a one of a kind opportunity considering that the game released just a few days ago. This offer is available to the residents of the United States considering that you need a Best Buy account in order to claim your Digital Code. The code will be delievered to you after the purchase in your inbox with instructions on how to redeem it on Origin. Other Expansion Packs for The Sims 4 are also 50% off so make sure you take advantage of this crazy Cyber Monday sale! I tried to buy it. And everything went through and then they cancelled my order and refunded my money in a mere matter of minutes. I’m not sure why either. They cancelled my order also. I have placed a second one with PayPal. They said they needed my credit cards email address to confirm. Like I know their fraud departments email address. I was so happy when someone posted this to a Sims group I’m in FB! I had been waiting all weekend.